Search Results for "girl teenager"
Girl teenager using electronic tablet lying on the couch in warm PJ's. Girl teenager in the room on bed in warm pajamas through the Internet on the laptop. close-up of hands. Girl teenager warm pajamas talking on a cell phone with a friend at the Christmas holidays. Girl teenager in warm pajamas and glasses lies on bed and plays on the tablet pc. Girl teenager in warm pajamas, reading a book lying on the bed. 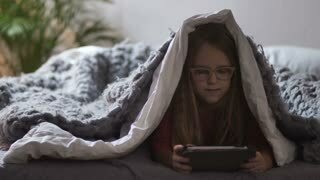 Cute girl lying under cozy blanket and using touch pad. Teen girl in eyeglasses playing games and watching cartoons on tablet computer at night in domestic room. Screen reflection in spectacles.